Wall tile installation pattern showing the "Drape" pyramid method. Veterans of floor tile installation may think that wall tile installation is a piece of cake. After all, it's nothing more than a vertical floor. However, wall tile installation has its own set of rules that you dare break at your own risk. After all, the penalty for poorly installed wall tile is a lifetime of having to look at the stuff. So, let's look at the basics of wall tile installation that will make everything go a lot smoother, less frustrating, and less costly. Vertical (wall) tiles are more visible than horizontal (floor) tiles. Vertical tiles can slide before they are firmly set into place. Walls, windows, doors and other reference points can create aesthetic havoc with wall tile. 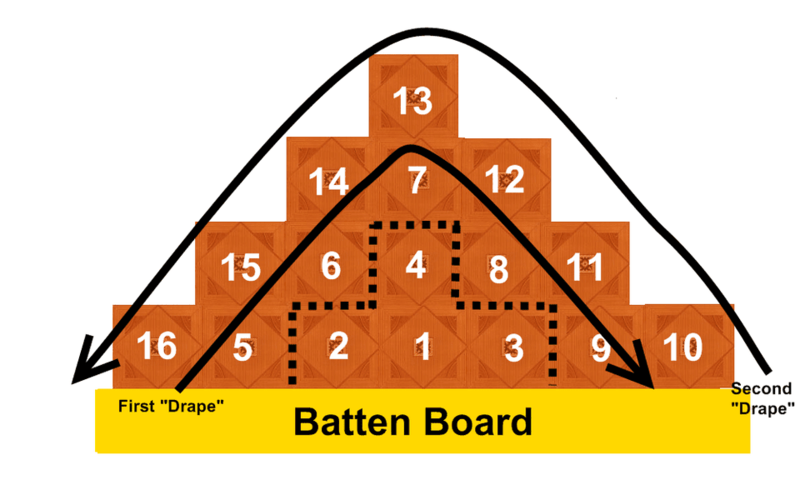 A batten board helps you start your bottom-most course or row of tiles. A batten board is nothing more than a 1"x4" or 1"x2" board screwed directly into the wall horizontally. Don't start it at the floor. Instead, bring it up to about 3/4 of the height of your tiles. So, if you're dealing with 4-inch tiles, your batten board would start 3 inches off the floor. So, you've got that bottom row of tile. Now what? Stack the tile vertically, one column at a time? Complete one row, then do the next one? Tiles #1, #2, #3, and #4. Begin your first "drape" on either right or left side, and walk it up, over, and down the other side. Repeat your second "drape" in the opposite direction. Tiles are square. Thus, they need to be installed in a square space. Holding a bubble level to a straight, six- or eight-foot board, make sure that both walls and the floor are plumb (vertical) and level. Surprise: they won't be. If your plumb or level is off by no more than a half-inch over the course of eight feet, it will show in your tile installation. But this can be remedied by taking the following step. If it is off by more than a half-inch, you need to correct the wall or floor. Additional trim and baseboards can cover up severe problems. Along the outside of your tile field, any tile "slivers" (tiles that are less than a half the width of the tile itself) will markedly show the out-of-plumb wall. You can remedy this by making sure that the tiles are positioned so that no "slivers" are used. Is Mold Remediation Just a Big Scam?